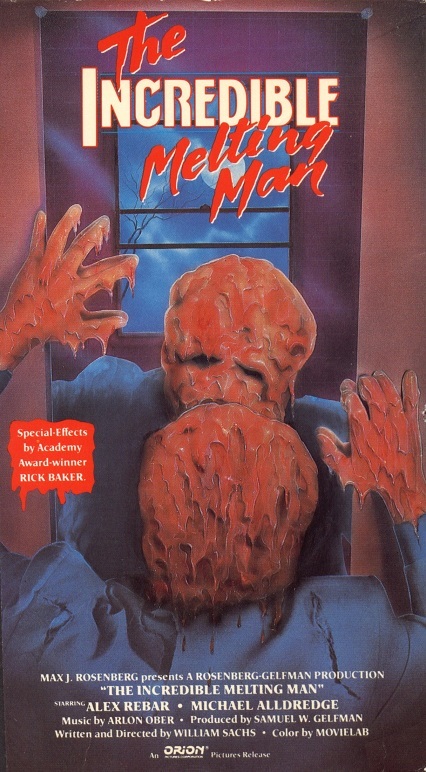 THE INCREDIBLE MELTING MAN: The Incredible Devolving B-Movie – Schlockmania! There’s nothing more frustrating for someone who loves movies than seeing a good premise squandered through uninspired filmmaking. This is a common type of heartbreak for schlock fans, who know all too well that the gulf between concept and execution can be hard to bridge, particularly at the low-budget level. However, that does not soften the blow: witnessing a beautifully bizarre concept get mangled always hurts. And that brings us to The Incredible Melting Man. If there was ever a wet-dream idea for monster movie fans, this is it. It begins with astronaut Steven West (Alex Rebar) flying to the rings of Saturn. Unfortunately, something goes wrong when his ship nears their destination and West returns a changed man: his flesh is melting, he super strong and he’s demented. 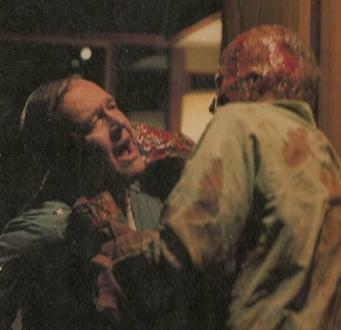 When he awakens in a government medical facility, he quickly breaks out and begins a campaign of terror, feeding on the locals to replenish his ever-melting flesh. Meanwhile, Dr. Ted Nelson (Burr DeBenning) and cranky General Perry (Myron Healey) try to track him down before the situation goes public. The plot is a basic, serviceable affair on paper and in the right hands it could have made a crackerjack little shocker. 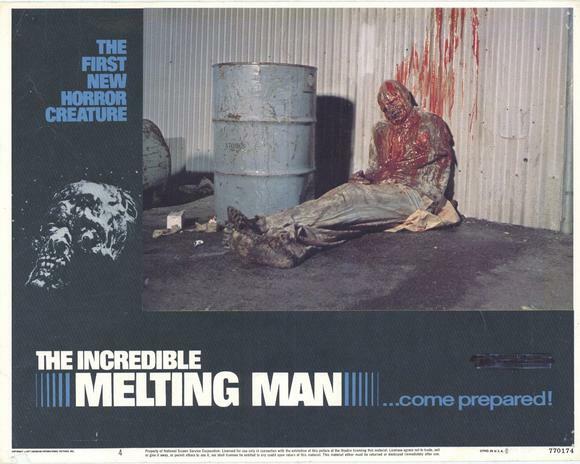 Unfortunately, The Incredible Melting Man was an idea that end up in the wrong creative hands. The writer and director here is William Sachs, a b-movie director better known for pseudo-scientific exploitation documentaries like The Force Beyond and the space-spoof Galaxina. He even managed a minor drive-in classic with the youthsploitation gem Van Nuys Boulevard. Nothing on that resume suggests he had the skills necessary to make a sci-fi/horror shock machine – and The Incredible Melting Man goes wrong in so many ways it is baffling. For starters, we never get to know Steven West before the mission so there’s no sense of tragedy or loss when he becomes a monster. Even worse, none of the interesting angles of the premise are explored: Dr. Nelson talks incessantly about figuring out West’s condition but the film never even tries to address what happened to him, what caused his condition or if it can infect others. Instead, Sachs wastes all the running time on badly written dialogue scenes and characters wandering around aimlessly. Even at 84 minutes, the film feels ridiculously padded with throwaway scenes, repetitive footage of the monster stumbling around and tons of forced comedy. The worst is a long, excruciatingly un-funny scene in w hich a pair of senior citizens decides to stop and pick some lemons (!) en route to their destination. The two performers are wretched, the dialogue is cringe-worthy and the whole escapade is scored with the kind of bouncy ‘comedy music’ you’d expect from an old cartoon. Uneven acting just makes things worse. Healey does a solid job of portraying a crusty bureaucrat but DeBenning is as wooden as he is bland – his non-emoting during a scene where he watches the monster attack and kill a friend is unintentionally hilarious. B-movie vets Janus Blythe, Rainbeaux Smith and director Jonathan Demme (!) all make cameos but never get the time – or the material – to make an impression. Behind the camera, Sachs’s thoroughly inept direction makes the action a chore to watch: he often frames onscreen action too far away for it to make any impact, lacks the sense of timing necessary for building suspense and makes bizarre choices like sta ging a big dialogue scene in front of noisy machinery. The final blow is dealt by terrible editing, which often abruptly cuts back and forth between scenes in a way that disrupts all dramatic flow and reduces the action to incoherence. Even scenes that don’t suffer this intercutting fail to work. For example, there is a scene where the monster attacks a character inside a house: the character is shown moving around a house in long shot. He suddenly starts to move through the room, with no sound or visual cue to motivate him. This is followed by an abrupt cut to an opening door revealing the monster… but never a shot of the character opening the door! The editing is full of weird lapses in judgment like this and it makes watching the film a brain-twisting chore. 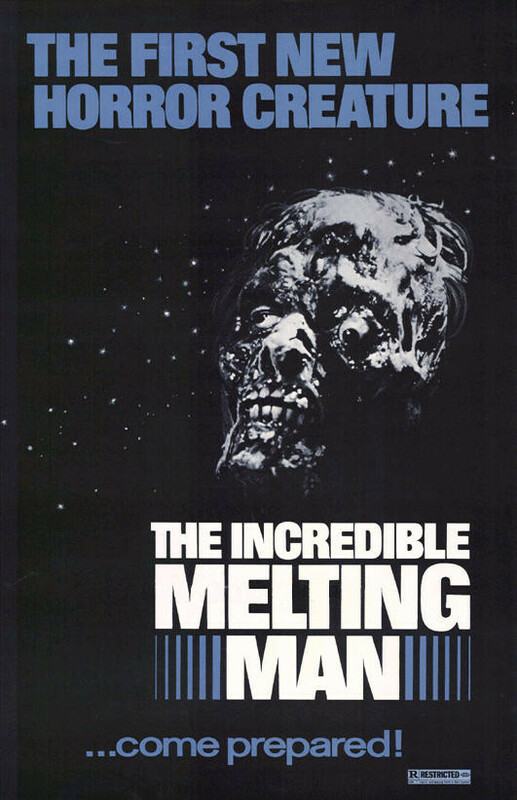 The only thing The Incredible Melting Man has going for it is the makeup effects by a young Rick Baker, which are suitably gooey and gross. Unfortunately, Sachs and crew manage to waste this asset by never showing West gradually succumb to his condition – he immediately goes from slightly disfigured to looking like a melting candle in the first fift een minutes and continues to look that way until the end. Baker designed four stages of decay for the character but they either weren’t all shot or were just edited so badly that they fail to make sense. In short, The Incredible Melting Man represents the bottom of the barrel for 1970’s monster movies – and it’s a painful reminder of the torture a viewer can endure when the wrong filmmaker gets his hands on the right idea. Like the hero, it comes apart before your very eyes – and what’s left behind is positively gruesome.